We were asked by a direct descendant from the original owner of an important American Federal Period inlaid mahogany tea/writing table made in or about 1788 in probably Winchester, Virginia, to assist in the object’s preservation. 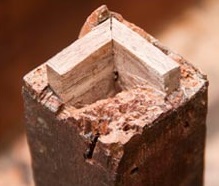 There were major structural as well as aesthetic condition issues which existed to include losses to inlay, separations in joinery, poor previous repairs, contaminate layers on the existing older/original coating layers, and staining and acidification on the original paper fragment. 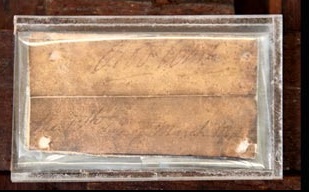 Our client wished to preserve the older ink stains on the top since they documented the long family history of use, which we agreed were an important aspect of the objects history. 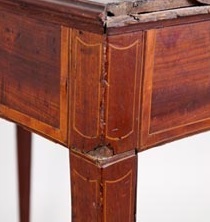 The table had a period handwritten note affixed to the underneath of the top which named the original owner and a date of 1788. As part of the treatment of the object, the label was removed and was given to a paper conservator to treat so that it could then be reinstalled in its original position in a conserve action manner. These images in this section show different aspects and phases of the treatment of the object by our firm. 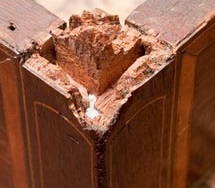 Below: The condition of the table before, during, and after treatment. 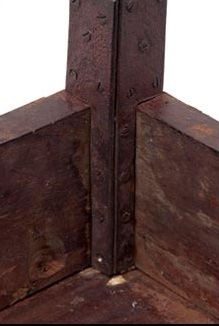 Notice the separation of the solid mahogany boards which make up the top, the losses to inlay and moldings, and the preservation of the ink stains and patina of the top, as requested by the client for historical significance. Right and Left: Areas of the leg which had suffered fractures and had been repaired and restored at least two times in the past. As part of our treatment plan, we corrected those previous repairs so that table could actually be used in a household setting, as it was originally intended. 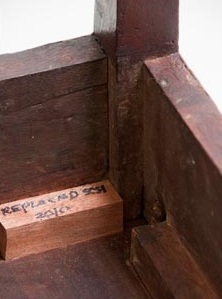 At Schuettinger Conservation Services, we regularly label our replacements as "replaced", indicated in the image below, to ensure that they are easily distinguished by other makers on whether it is an original or older replacement. This information is also documented in treatment reports for our clients. These mages to the immediate right depict areas where various markings were detected on this desk. 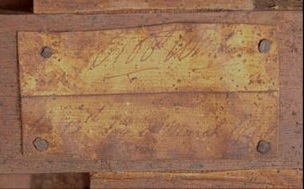 These marking were part of the original carver's layout.